Evidently seven springs feed water from the top of the park down into lake and on old maps of the area a small lake is shown, near where the present boathouse is situated. In recent years there have been various tales about when the lake was enlarged. During our research, we have proved that it must have been before 1874, as the Ordnance Survey map of that year shows the lake in its present shape. Major Spitty, who owned the farmland at the time, loved shooting wildfowl and wanted to impress his many friends, including Lord Kitchener, who shared the sport with him. Rumour has it that local men, on returning from the Crimean war, found themselves out of work due to an agricultural depression. Major Spitty came to their rescue by employing them to dig out the lake by hand for one shilling a day (equivalent to nearly £5 today), whilst also giving them a good dinner. The lake was supposed to be ‘S’ shaped but either Major Spitty ran out of money, which is doubtful as he was a very rich man, or the labourers had had enough! He also built two boathouses, one of which was a fort, long since disappeared, at the head of the lake. In 1966, the lake was emptied and the bank on the eastern side was strengthened. 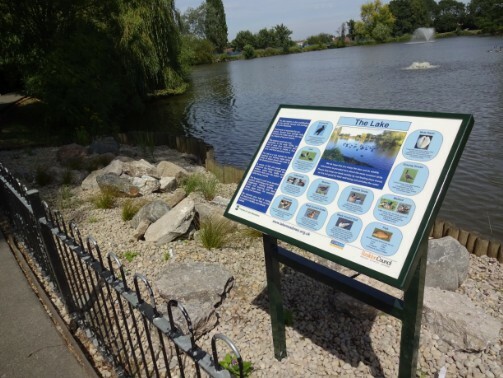 Many residents will remember the boats and pedalos on the lake - unfortunately they were removed from the lake and although many people have asked that they be returned, this is not a viable option now. From time to time the fish stock has been added to, including carp, terrapins and catfish. The Beast of Billericay, a giant catfish, is now about six foot long and has been caught on several occasions! The lake is home to many ducks and water birds, and also attracts a selection of visiting wildfowl.